Courtney is fresh into the TV business, no pun intended! A 2003 graduate of Jimtown High School, she has grown up in the Elkhart Community her whole life. 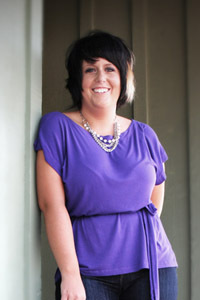 She is a 2007 graduate of Olivet Nazarene University with a degree in Mass Communications, TV/Video Production. While in college she was actively involved with Access ONU, Olivet's TV news magazine, where she served as a field reporter and entertainment anchor. She was an intern, locally, at WSBT in the news room, and also at TLN in Aurora, IL for the show Inspiration Sensation! as a Production Assistant. Post graduation, she has been with Fresh! since May of 2007, producing, editing, as well as hosting the food and design segments. She has also done a lot of free lance work in the areas of camera operation, editing, and graphic design, which branched out into her own company, SGH Productions. A unique factoid is SGH stands for Sister Golden Hair, which was her nickname given to her as a child by her father. It stems from the popular song by the group, America. In her spare time, Courtney loves playing and watching sports, decorating, cooking, reading, concerts, and taking as many trips into Chicago as she can. She is a self-proclaimed music and movie snob and a reality show junkie. And by snob, she means passionate. :) She loves humor and laughs a lot and this show provides all of that for her!